On the Landsat Satellite Image, a distinctive feature is visible more or less in the center of the National Park, midway between the Sarstoon and Temash Rivers. The bluish color on this image suggest a very open habitat, not a forest at all. Unfortunately this habitat is very difficult to reach as it is surrounded by dense swamp forest that is inundated through much of the year. Consequently, no scientists that we know of ever visited the area. During the 2003 REA, the Barranco parataxonomist trainees made an attempt to reach this enigmatic area while it was still at the peak of the dry season (May). 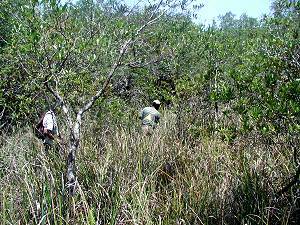 We approached the habitat from the north, cutting our way for 2 km (1.3 ml) through the swamp forest. This forest, although not inundated at this stage was still wet and very difficult to walk through. As the temperatures during this time of year are typically very high, we found the trip very trying and we soon ran out drinking water in spite of the generous amount that we started out with. What we found was a very unusual ecosystem. Not very attractive and if possible, even more terrible to traverse. 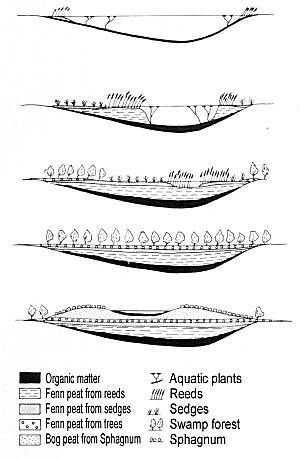 The landscape consisted of low, dense, but open canopied scrubland with a dense understory of sedges (Furena umbellata? ), all of this growing on a bog of Sphagnum moss (possibly Sphagnum subsecundum or S.portoricense). 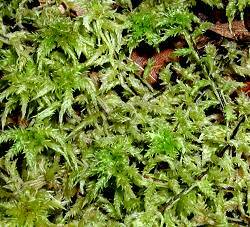 Sphagnum moss is rare in Belize and restricted to higher elevations such as Victoria Peak and the Mountain Pine Ridge. Finding it in Belize at sealevel in these quantities was nothing less but astounding. Because of the difficulty penetrating the area, we managed to reach only the outer perimeter of the whole ecosystem. 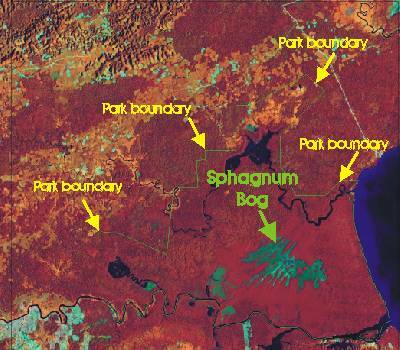 If the ecosystem is as uniform as the satellite image suggest, the whole ecosystem is no less than 2700 acres (1100 ha) large! Sphagnum is intolerant of nutrients, limestone, salt and drought. Consequently it is found in situations where it is rainfed. For the Sarstoon Temash situation this means that the area does not receive any overflow from any of the rivers (which contain salts, nutrients and lime). Typically a peat bog develops when a wetland fills in with organic matter forming a thick layer of fenn peat. This fenn peat can have different origins such as; reeds, sedges and tree-leaves. Once the wetland has been filled in, a swamp forest forms. If this swamp forest does not receive any outside nutrients, but is wet year round, Sphagnum moss can develop. Under the right conditions this Sphagnum moss can outgrow the trees and completely envelop them, forming a raised Sphagnum bog (figure to the right adapted from Visscher, 1949). The bog in the Sarstoon Temash NP appears to be in-between the two last stages. From here it could technically be expected to grow in a real raised bog but many factors such as drought or fire could interrupt this process. The vegetation in the bog apart from the sedge (Hypolytrum longifolium?) and the moss Sphagnum (subsecundum? ), proved to be very species poor and consisting of species that are otherwise mostly known only from higher elevation areas on very poor acidic soils such as the Mountain Pine Ridge. A very attractive shrub was Purdiae (Schizocardia) belizensis (Left). 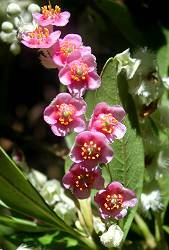 Other species included Cyrilla racemiflora, Clusia cf. massoniana, Connarus lamberti. Symphonia globulifera, Ouratea sp., Acoelorraphe wrightii, Blechnum ferns, Palicourea cf. crocea, Calophyllum brasiliense and a few as yet unidentified species. Wildlife was very poorly represented. Which is not surprising given the inhospitable conditions. There were even very few birds. The butterfly Calospila sudias was quite common but the most unusual form of wildlife was the incredible amount of Stick Insects (Phasmidae) seen. Literature: Visscher, J., 1949. Veenvorming. Gorichem, Noorduijn's wetensch. reeks 33. 115 pp.